Get nine to ten stimulus items on the back of each of these full-color cards! Use them to target ten major language skill areas, including semantics, social communication, making inferences, paraphrasing, listening, and more. You get 200 cards (20 cards for each of the ten skill areas) portraying everyday situations. 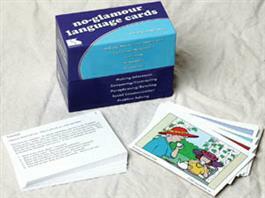 Instruction cards for each skill area include teaching rationale and therapy tips. The cards are sequenced by language skill complexity. Asking/Answering Questions - The student answers wh-, how, and if questions and generates questions about the picture. Exclusion/Negatives - The student tells if a statement is true or false, answers questions that contain negative markers (e.g., doesn't can't, isn't), makes inferences based on facial expressions, completes sentences that require some reasoning, and identifies what doesn't belong in a list of words. Listening - The student looks at a picture that signals the likely overall context of a story. The therapist then reads the story out loud and asks the student questions about the story. Semantics - The student explains common idiomatic expressions, states antonyms and synonyms, makes associations, names items in a category, and explains multiple meaning words. The student listens for grammatical errors in sentences and fixes them. Errors are based on sound confusion (e.g., himset vs. himself), semantic substitutions (e.g., square vs. round), and verb tense. The student listens to a string of words and re-sequences them to make a logical, complete sentence. The student responds to questions using present, past, and future tense verbs in his answers. The student formulates grammatically-correct questions. The student studies a picture and answers questions that require him to make inferences about it. Some of the questions rely on interpreting body postures and facial expressions. The student reasons, expresses logical answers, gives opinions, and predicts what might happen. Comparing/Contrasting - The student gives general descriptions and responds to questions by telling how things are alike and different. Paraphrasing/Retelling - The student either reads a story or listens to a story. Then the student retells the story in his own words. The stories are easily shortened to make the task easier. Social Communication - The instructor gives an explanation of the picture and asks the student questions about it. The student must interpret body postures and facial expressions and answer questions with logical explanations and examples of socially acceptable behaviors. Problem Solving - The student identifies problems, makes inferences, predicts consequences of actions, and tells characters what to do to solve their problems.